Just had my FaceTime meeting with Jan, my language acquisition coach. I'm getting a little better with both the technology and the ergonomics; this time I was able to talk to Jan on the iPad while typing notes on the computer. Next time I'll document my setup. With her permission, I'll take a photo of Jan's image on my iPad with my iPhone and then upload it to iPhoto on my iBook. Jan asked me a lot of questions today during our 1-hour session. The one that resonated the most was: "What do Amharic speakers find funny?" I realize I have little chance of answering this question at this early point in my project, but it's one that I will keep in the back of my mind as I progress. I enjoy humor...especially humor that originates from language itself. I had a small hint at Amharic humor on Tuesday, when I went back to New Eritrea Restaurant to see Manna and pick up dinner. I told him I was learning the Amharic alphabet and he showed me how to write the 'k' and 'l' groups of syllables. Thus, I was able to write the very useful word "Coca Cola." 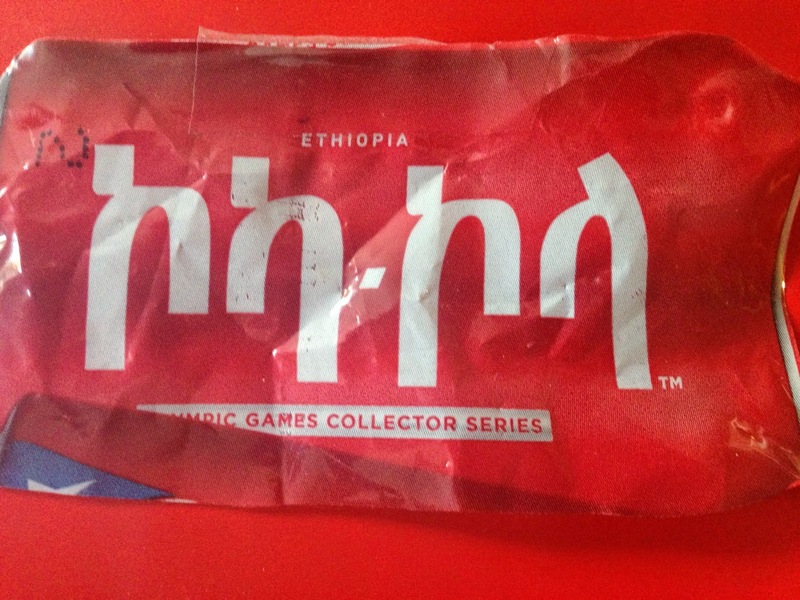 Manna then pulled out a Coca Cola label he had saved from the Olympic Games Collector Series. The Amharic vowels 'a' and 'o' are often designated by a shortened leg on the left and right, respectively, of the consonant form. Manna explained that because of this, Coca Cola is known as "short legs" where he comes from. I suppose this is somewhat humorous in itself, but I think the humor is compounded by the fact that the label commemorates the Olympic Games. In the Summer Olympics, Ethiopia competes almost exclusively in running events, and Ethiopians actually have rather long and equally-sized legs. That the drink known in Ethiopia as "short legs" serves as an official sponsor of the Olympics is...well, funny. At least I think so. Stay tuned for more scintillating Amharic humor in future posts!